A year ago, my good friend Nathan (Nate) Blaylock called me wanting help. He was conducting research on population statistics in Midwestern states and found it was important to the citizens to show compassion and support causes. Nate wanted to brainstorm with me on how he could make an impact and support a cause in his position as Klim’s Promotions Manager. I was never able to have that conversation with him before he was taken from all of us too soon. Although I would have loved the chance to work with him and brainstorm on how we could achieve his goal, his comment left a footprint I can’t wipe away. Over the past year, I found organizations from all levels asking me about fundraising. They looked to me as an expert, which baffled me. I’ve never thought about fundraising as a skill, it’s always just been something that came with the job. It wasn’t until this summer that I realized I’ve helped raise more than $200,000 for organizations including everything from breast cancer awareness, snowmobile organizations, multiple scoliosis (MS), kidney organizations and many others. It was at that point, I realized just maybe, there was an expert somewhere deep inside me. The problem … I still have to find that expert but I’ll do my best to write about something others feel I specialize in. “If you don’t have the passion for the cause, you won’t have the passion to sell it!” Envision you walking by one of the sales boutiques at the local mall. The salesperson has the coolest new gadget no one can live without! If the salesperson doesn’t look up, say hi or even smile, will you stop? Probably not, you’ll keep walking thinking “Whew, glad they left me alone, hope the next one does too!” Now, envision the salesperson smiling, giving a friendly “Hi” and seems genuinely happy to be at work. Will they get your attention? Will you wonder what is so great about this new must have gadget? Even if you decide not to stop, the salesperson did one thing! They got your attention. Hosting a fundraiser to support a cause puts you 10 steps ahead of the sales game because people like the idea of helping others. Remember the golden rule to treat others with the same respect you want and a friendly smile will go a long ways. “Don’t be afraid to think outside of the box!” Being an avid snowmobiler all my life and employed within the industry the past 10 years has caused most of my fundraising efforts to support organizations focused on the recreation. It didn’t take long to see one common trend; the supporters were always the same group of people. These are the individuals that, year after year, come out and support a cause. They are greatly appreciated and are definitely needed at any fundraising event. But if an organization wants to survive and see increases from one year to the next, new pockets must be found for support. So how do you gain new pockets to support your cause? Well, my box was filled with snowmobilers. I had to crawl outside of the box to find non-snowmobilers and future supporters. It’s very common that a snowmobile club wants to fundraise for their organization by hosting a snowmobile related event. After all this is why snowmobilers join clubs … to ride. 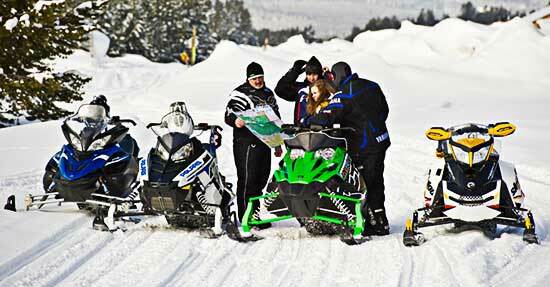 These are necessary events to keep excitement for organizations but it’s OK to host a fundraiser outside of snowmobiling to raise those additional funds and meet the organizations goals. If you can’t come up with any ideas, type in the word fundraiser in a Google search, I guarantee there will be more clicks and tips than could ever be imagined. Lastly, “Don’t forget a little shock value goes a long ways!” Bret Rasmussen “Schooled” everyone and I bet no one has forgotten, “Trees are for Traction and Not for Hugging!” “Save the Tatas” loves them all, big or small! And who can deny the “Furtle Turtles” motto “Slow to go but sure to grow” which has helped raise more than $7,000 for causes selected by its North Dakota snowmobile members in seven years. “Shock Sells” and a catchy slogan will leave footprints that won’t be erased creating awareness for years to come!